Manila, 22 October 2017 – Abu Dhabi, the European Commission, Germany, Monaco and Philippines tonight became ‘Champions’ in the global fight to protect migratory species. The awards, on the eve of the triennial summit of the Convention on Migratory Species (CMS COP12), recognize their contributions to solving some of the critical issues facing migratory species, by delivering support beyond funding. The five new Champions were honored for initiatives ranging from combating illegal killing of birds to implementing concerted measures to preserve marine life. 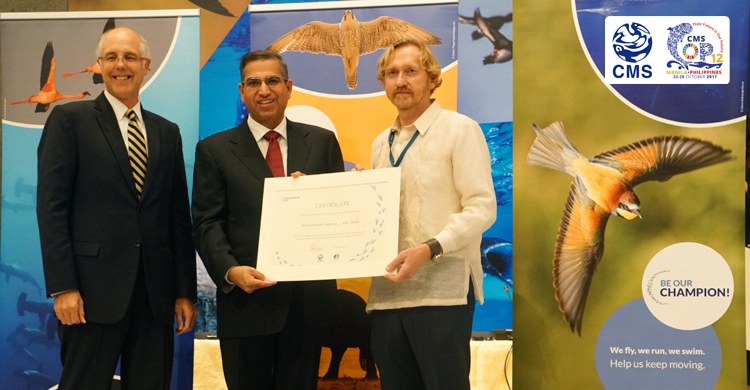 The Environment Agency of Abu Dhabi was recognized for the Conservation of Birds of Prey in Africa and Eurasia for the period 2015-2019 and the conservation of Dugongs and their Habitats for the period 2015-2019. The European Commission was awarded for its efforts in addressing Illegal Killing, Taking and Trade of Migratory Birds in the Mediterranean in 2018-2020. Stefan Leiner, Head of the Biodiversity Unit in the European Commission and Head of the EU Delegation at CMS COP 12 said: “I am very honoured to receive on behalf of the European Commission the CMS Champion Plus Award for the Commission's support to the work of the CMS Secretariat, in particular its Task Force on Illegal Killing, Taking and Trade of Migratory Birds in the Mediterranean. All wild bird species natural occurring in the EU, including those listed in the CMS appendices are protected across the 28 Member States by the EU Birds Directive. However, many of these species, including migratory birds, still face many pressures and threats. Illegal killing, trapping and trade of birds, both within the EU and in its neighbouring and partner countries, are still serious concerns. Within the EU we need to redouble efforts to fully implement the Birds Directive, which strictly prohibits such activities. The work being done by the CMS and the Agreement on the Conservation of African-Eurasian Migratory Waterbirds in promoting coordinated action to combat this scourge is essential to protect and restore healthy populations of our extraordinary shared natural heritage of wild bird species. The Principality of Monaco was commended for its commitment to Marine Species Conservation 2018-2020. "Being part of the CMS Champions programme gives the opportunity to Monaco, a tiny State, to contribute globaly and concretely to the global effort in favor of protecting these not only amazing but crucial species," said Ms. Isabelle Rosabrunetto, Director General of the Ministry of Foreign Affairs and Cooperation. The Government of the Philippines was awarded for its efforts to protect the Whale Shark. Secretary Roy A. Cimatu, Department of Environment and Natural Resources, Philippines Environment and Natural Resources, said: “We need more champions in our continuing fight against hunting, habitat loss, pollution and wildlife trade." Launched in 2014, the Migratory Species Champion Programme has recognized several institutions. It is open to Governments, companies, organizations and individuals willing to make a financial commitment of at least three years for one or more specific initiatives that fall under the CMS family umbrella. It offers a portfolio of initiatives that contribute to the implementation of a large programme targeting a species, a group of species or a cross-cutting issue. To learn more about the Champion Programme, visit the dedicated pages on the CMS website.